In 1779 Spain had joined France in support of the American Revolution. In 1780 a series of British military operations were carried out to clear Spanish influence from Quebec to the Gulf of Mexico. Capt. Henry Bird, with a force from Detroit, was directed to attack George Rogers Clark at the Falls of the Ohio. General John Campbell, 5th Duke of Argyll, from Pensacola, after taking New Orleans was to proceed up the Mississippi to Natchez and join a third force that descended the Illinois River and captured St. Louis. Capt. Charles de Langlade was to lead the force down the Illinois, which was to split up and also control Vincennes. None of the missions were successful, but there was a slight break in Spanish rule of Louisiana. Faced with the costs of military activity in Europe and slave rebellions in its North American holdings, Emperor Napoleon of France in 1803 chose to sell the Louisiana Territory to the United States. On April 30, 1803, the United States paid France nearly $12 million and assumed debts of the French government of an additional $3 million. The United States formally took possession of Louisiana on December 20, 1803. Upper Louisiana, including Iowa, however, was not transferred until March, 1804. 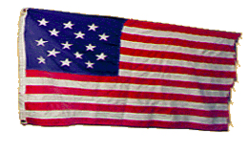 (4) The five flags, therefore, were the Fleur de Lis of France (1682–1762), the Royal Flag of Spain (1762–1800), the Union Jack of Great Britain (1780, during the American Revolution), the French Republic Flag of Napoleon (1800-1804) and American flag (1804–Present). [[File:fivef.jpg|250px|thumb|left|]]FIVE FLAGS CIVIC CENTER. The Five Flags Center was a multipurpose facility in downtown Dubuque named for the five flags that have flown over Dubuque; the Fleur de Lis of France (1673–1763), the Royal Flag of Spain (1763–1803), the Union Jack of Great Britain (1780, during a brief interruption of Spanish rule), the French Republic Flag of Napoleon (1803) and America's Stars and Stripes (1803–Present). [[Image:THEATERHISTORY.png|left|thumb|250px|Theater History. Courtesy: Telegraph Herald]]The [[ORPHEUM]], the existing theater, was the last of a legacy of theaters at 4th and Main. By 1969 the building had fallen into disrepair and was scheduled for demolition during [[URBAN RENEWAL]]. Known as the [[MAJESTIC THEATRE]], the existing theater was designed and built in 1910 by C.W. 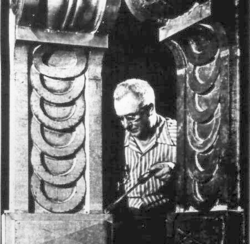 and George L. Rapp of Chicago, who went on to become America's premier theater architects. 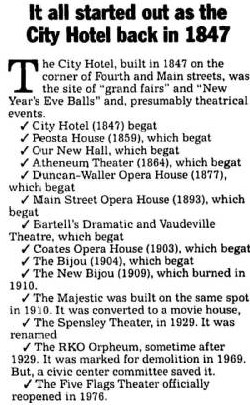 From 1929 to 1933 it was owned and operated by prominent local businessman [[SPENSLEY, Harker Brentnal, Sr.|Harker Brentnal SPENSLEY, Sr.]] Spensley, who was the president and manager, named the theater "The Spensley." Four years later, it became part of the RKO film theater circuit and was renamed the RKO Orpheum. By 1969 the building had fallen into disrepair and was scheduled for demolition during [[URBAN RENEWAL]]. A committee of concerned citizens led by [[NORMAN, Wayne Andrew Sr.|Wayne Andrew NORMAN, Sr.]] began a fund drive to save the theater, which was incorporated in the Five Flags Center project in 1972. Restoration was begun in 1975, and the theater was reopened in 1976 as the Five Flags Theater. It is currently the home of the [[DUBUQUE SYMPHONY ORCHESTRA]], high school musicals, and occasional concerts and ballet productions. [[File:fiveflagsst.png|250px|thumb|left|]]Five Flags Arena was conceived as part of a project to rehabilitate the Five Flags Theater. Construction began in 1976, and the facility had its grand opening on March 24, 1979. The $3.7 million complex wrapped around the theater and extended north between Locust and Main [[STREETS]]. Proposals for aid were presented to Iowa Governor Robert Ray; Murray Goodman, Iowa Director of the American Bicentennial Commission (ARBC); and Del Black, regional director of ARBC. Each endorsed the idea, but offered no hope of financing. In February, 1973 a delegation including Wayne Norman, Five Flags chairman; Mayor [[BITTER, Joseph|Joseph BITTER]], a county supervisor and 24 Five Flags committeemen flew to Washington, D.C. On their invitation list to see a presentation about the project were the entire Iowa congressional delegation; officials from Housing and Urban Development; and representatives from the departments of Interior, Health, Education and Welfare, National Trust for Historic Preservation, ARBC, and the Bureau of Parks and Recreation. Their theme was a multi-media theater that would depict the development of the Upper Midwest and its importance to the nation beginning with the adventures of [[CARDINAL, Jean Marie|Jean Marie CARDINAL]]. According to their plan, the entire center in 1976 would be devoted to the bicentennial with frontier exhibits, multi-media theater, and perhaps a commissioned play. The center would later serve the tri-states. Their appeal was for $1.4 million--two-thirds of the $2.1 million needed to refurbish the Orpheum and construct the civic center. (7) Nothing came of the effort. [[File:fiveflagsst.png|250px|thumb|left|]] On August 16, 1976 Dubuque voters approved a $3.7-million bond referendum to begin construction in the fall. The final vote was 70% positive with 60% needed to pass. (14) The facility had its grand opening on March 24, 1979. The area featured one side of permanent seating; the other three sides were bleachers, some for [[LORAS COLLEGE]] basketball, and most of Dubuque's major concerts. High school graduation ceremonies for [[STEPHEN HEMPSTEAD HIGH SCHOOL]] and [[DUBUQUE SENIOR HIGH SCHOOL]] were regularly held at the center. High school graduation ceremonies for [[STEPHEN HEMPSTEAD HIGH SCHOOL]] and [[DUBUQUE SENIOR HIGH SCHOOL]] were regularly held at the center. Five Flags Center was the former home of the [[DUBUQUE FIGHTING SAINTS]] (1980-2001) of the United States Hockey League from 1980–2001 and the home of the Dubuque Thunderbirds hockey team of the Central States Hockey League from 2001–2010. The Five Flags Center was the main convention center in Dubuque. The Center featured a large exhibition hall with seating capacity of 4,700. The hall could be converted for use as an ice hockey rink with the removal of an insulated floor laid over the ice. It was the former home of the [[DUBUQUE FIGHTING SAINTS]] (1980-2001) of the United States Hockey League from 1980–2001 and the home of the Dubuque Thunderbirds hockey team of the Central States Hockey League from 2001–2010. Construction of other venues impacted the use of the Center. In 2003 the building of the Grand River Event Center moved many events away from Five Flags. The [[MYSTIQUE COMMUNITY ICE CENTER]] hosted the Dubuque Fighting Saints. Construction of other venues impacted the use of the Center. In 2003 the building of the Grand River Event Center moved many events away from Five Flags. The [[MYSTIQUE COMMUNITY ICE CENTER]] hosted the expansion Dubuque Fighting Saints. SMG took over operations of the arena in 2004, which were formerly handled by the City of Dubuque. In 2005, the arena was closed during the summer for concession, entrance, and concourse renovation. 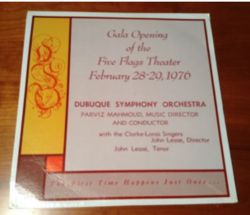 NOTE: For a video history of the Civic Center, see: http://cityofdubuque.granicus.com/MediaPlayer.php?view_id=3&clip_id=2426 produced by the City of Dubuque. The ORPHEUM, the existing theater, was the last of a legacy of theaters at 4th and Main. By 1969 the building had fallen into disrepair and was scheduled for demolition during URBAN RENEWAL. In February, 1973 a delegation including Wayne Norman, Five Flags chairman; Mayor Joseph BITTER, a county supervisor and 24 Five Flags committeemen flew to Washington, D.C. On their invitation list to see a presentation about the project were the entire Iowa congressional delegation; officials from Housing and Urban Development; and representatives from the departments of Interior, Health, Education and Welfare, National Trust for Historic Preservation, ARBC, and the Bureau of Parks and Recreation. Their theme was a multi-media theater that would depict the development of the Upper Midwest and its importance to the nation beginning with the adventures of Jean Marie CARDINAL. According to their plan, the entire center in 1976 would be devoted to the bicentennial with frontier exhibits, multi-media theater, and perhaps a commissioned play. The center would later serve the tri-states. Their appeal was for $1.4 million--two-thirds of the $2.1 million needed to refurbish the Orpheum and construct the civic center. (7) Nothing came of the effort. On August 16, 1976 Dubuque voters approved a $3.7-million bond referendum to begin construction in the fall. The final vote was 70% positive with 60% needed to pass. (14) The facility had its grand opening on March 24, 1979. High school graduation ceremonies for STEPHEN HEMPSTEAD HIGH SCHOOL and DUBUQUE SENIOR HIGH SCHOOL were regularly held at the center. Five Flags Center was the former home of the DUBUQUE FIGHTING SAINTS (1980-2001) of the United States Hockey League from 1980–2001 and the home of the Dubuque Thunderbirds hockey team of the Central States Hockey League from 2001–2010.